A pinhole camera uses a small hole to create an image. There is nothing between the image and the light sensitive material: no lenses, no electronics, no exposure meters, no multi coated auto buzzing flashing anything, just space and a bit of time, to allow light to do its thing and travel in a straight line. People have been viewing the effects of a pinhole forming an image for thousands of years. Even now a crescent moon (or eclipse) can be viewed on the ground as the light passes through the gaps in a leaf canopy. The earliest record was by Mo Ti in China and Aristotle, both around 400 BC, who projected the Sun through a small hole. Back then, the hole was the only device known for experimenting and understanding the properties of light. The introduction of lenses within camera obscuras, combined with the discovery of light sensitive materials in the 19th century – in my home town of Bristol (UK) where Humphrey Davy and Thomas Wedgwood created shadows of leaves on parchment in 1803 – evolved into the cameras we use today. Lenses allowed far more light than a pinhole resulting in far shorter exposure times. Since the main object people wanted to photograph was themselves (some things never change!) the pinhole was relegated to a novelty for over 100 years until in the 1970s and 80s when people rediscovered the unique light gathering properties of a small hole. Since the growth of digital photography there has been a significant resurgence in the interest of pinhole photography, both as an effective way of experimenting with light, as well as a rejection of the automation and predictability in the commercial photographic world. Anyone can make a pinhole camera, from simple ‘box’ obscuras to adapted slr cameras. Anyone can create an image through a small hole. One of the most basic but effective cameras is an empty drink can with a hole in the side containing a sheet of ‘traditional’ light sensitive photographic paper. I began using these 25 years ago when teaching photography to students who couldn’t afford cameras. (They could however afford several cans of Coke every day!) So I got them to make coke can pinhole cameras and I was hooked. No viewfinder, no exposure meter, only a tape shutter to remove and ‘feel’ the light travelling through the hole onto the light sensitive photographic paper. A look at intensity, contrast, colour temperature then the light is then allowed to flood in for a pre judged period of time from several seconds to several months. Stepping out of the 1/25th second ‘human evolved’ perception into a durations of time uncovering a world beyond vision. 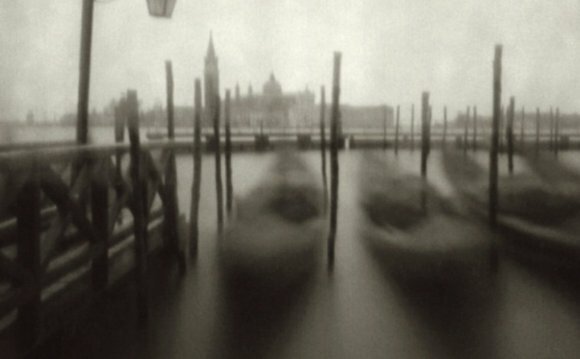 A pinhole has unlimited depth of field, (everything imaged by a pinhole is in focus), allowing ‘distortions’ impossible with commercially bought cameras. From wide angle 360 degree images to anamorphic ‘stretched’ imagery cameras made from tubes create images closer to the genius of Holbein than the overused effects in photoshop. They can be made from: Ostrich eggs, books, lego, washing machines, the Berlin Wall, traffic cones, bins, plastic toys, potatoes, a roast duck and biscuits. Some are the size of an aircraft hanger whilst some can fit inside ones mouth. They can be indestructible, dropped from buildings, stuck onto boomerangs or used as a shuttlecock. They can be waterproof, or filled with water! They are also homemade and very cheap! My favorite is an aluminium drink can with a small hole in the side and a light tight cap made from card. This is removed to place light sensitive photographic paper within the camera, upon which the image is formed. When the hole is uncovered for a few seconds, the light forms a latent image on the photographic paper which can be revealed using traditional photographic chemicals. This negative image can then be scanned using a scanner or photographed in inverse using a mobile phone, to show the image in positive as well as embracing 200 years of photography from Fox Talbots negative to the digital image capture within the technology of a mobile phone. Many of us also explore camera obscuras in their many varied forms, whether hand-held, room sized or worn on your head! They too create instant wonder in light. There is nothing better than to switch off the light in a classroom and hear the gasps of amazement at a ‘real’ projected image. We have become so used to digital projections the idea of viewing ‘live’ reality is quite an epiphany. The same today as it was 2500 years ago when Mo Ti surmised using a camera obscura that light, travelled in straight lines ‘like arrows being fired’. Its wonder will outlive all commercial technology stay with us as long as there are people to find wonder in the light gathering properties of a small hole. Justin Quinnell was born and lives in Bristol in the UK and completed his degree in fine art photography at Derby Lonsdale College. A freelance photographer and lecturer for the past 20 years he has also been: head of photography at South Bristol College, a school teacher, worked in a wood, promoted cycling and managed a safari camp in the Maasai Mara in Kenya. Currently a part time lecturer at Falmouth University and has taught all over the UK as well as the Design Museum, The British Library, Lacock Abbey, Lomo New York and the Corcoran. He has done lecture tours of both the US and Australia.